The clocks have gone forward. So when leaving the office (around 7 pm today) there's still enough light for some decent snaps. Since Sunday we've had lovely spring weather. After sundown that clear sky glows iridescent and contemporary Warsaw lights up with a confident radiance. 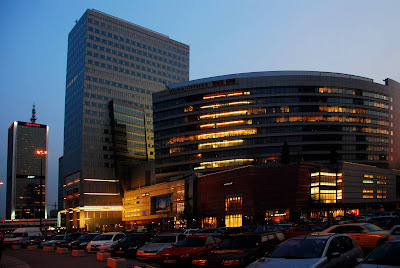 Above, from left: The LIM building (Marriott Hotel) and the Złote Tarasy office and retail centre, undoubtedly boasting a fine array of shoe shops. Is this Manhatten? Are we in Tokyo? 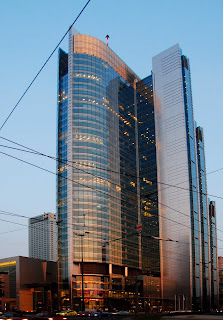 No, this is Rondo ONZ 1; to me, Warsaw's most beautiful modern office development. Standing on the corner of al. Jana Pawła II and ul. Świętokrzyska, the building catches the last rays of the sun as it sets over Wola. To the left of Rondo ONZ 1 is the Intercontinental Hotel. Left: The view looking west along ul. Swiętokrzyska. The building in the foreground is the Warsaw Financial Center on the corner of ul. Emilii Plater; in the distance is Rondo ONZ 1. 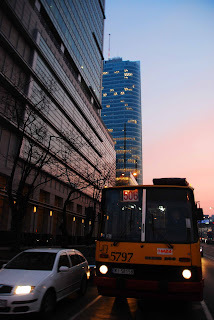 A 506 bus heading from Wola to Bródno makes its way through Warsaw's central business district. The Hungarian-built Ikarus buses will disappear from Warsaw's streets by 2010 to make way for low-floor, wheelchair access, air-conditioned, low-emission Solarises, Neoplans and MANs. While not as immediately iconic as London's Routemaster double-deckers, the 'Ikars' will be missed. 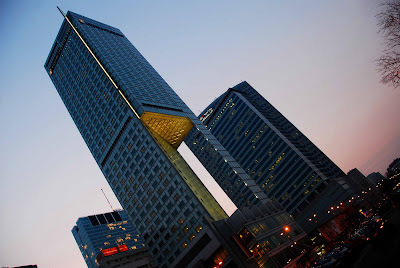 Above: The Intercontinental Hotel, Warsaw. Another noteworthy modern building. The cutaway 'leg' on which the hotel stands was designed so that inhabitants of the apartment block behind it would continue to receive as much daylight as before. The 'Interconti' is one of the world's highest five-star hotels; its swimming pool on the 40th floor is on the same level as the clock on the Palace of Culture opposite.